Acrylic is a highly versatile and cost-effective material that can be used to make beautiful, professional-looking signs and lettering. A durable, weather-resistant plastic, it can be worked into many different shapes, and used in conjunction with other materials to create striking designs. 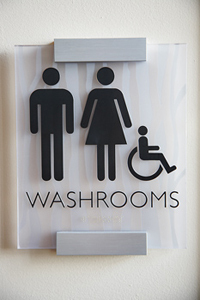 We can create ADA signage with braille using acrylic, or cut your logo out of it to make a classy 3D lobby sign. Acrylic is available in a variety of colors, finishes and thicknesses- even clear! Call Signs4Success and put us to work designing a terrific acrylic sign for you!